On Saturday night, the UFC returns to the Frank Erwin Center in Austin, Texas, for the first time in over four years as UFC Fight Night 57 brings some amazing match-ups to free television once again. Headlining the event is a featherweight match-up with title implications, as the surging Cub Swanson faces off against perennial contender and former lightweight champ Frankie Edgar. Swanson is currently on a six-fight winning streak, four of which ended in knockout, to put himself in position for a shot at the title. Edgar, however, is on a title hunt of his own and is potentially one fight away form another shot at division champ Jose Aldo’s long-held strap. This is sure to be a fight for the ages. In the co-headliner, another rising star, Bobby Green, faces off against Edson Barboza, who will be looking for another dazzling finish. 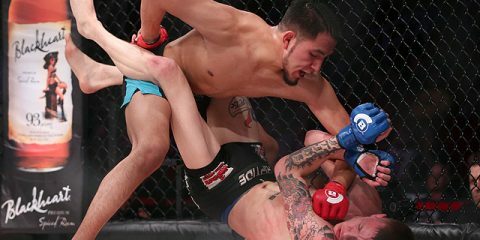 Flyweights Joseph Benavidez, Brad “One Punch” Pickett, Chico Camus and Dustin Ortiz look to add some depth to the UFC’s shallowest division. Heavyweights Jared Rosholt and Oleksiy Oliynyk are set to rumble the cage. Rounding out the main card, there’s the long-awaited return of veteran Matt Wiman, who faces off against Isaac Vallie-Flagg, a fighter who is looking to break his two-fight losing streak to keep his job with the UFC. While the main card is stacked with great match-ups, the undercard also includes the debuts of Josh Copeland, Paige VanZant and Doo Ho Choi, making for a very exciting night of fights. The first two prelims of UFC Fight Night 57 take place on UFC Fight Pass at 7 p.m. ET, with the remainder of the card airing on Fox Sports 1 starting at 8 p.m. ET. Combat Press writers Bryan Henderson and Dan Kuhl square off to preview the card in this edition of Toe-to-Toe. Cub Swanson has been on a roll. He went from an inconsistent fighter who posted a 5-3 mark in the WEC and lost his Octagon debut to becoming a dominant fighter on a six-fight winning streak. While he defeated a string of borderline contenders along the way, Swanson’s biggest test comes against Frankie Edgar in the UFC Fight Night 57 headliner. Is this a test he’s capable of passing? Henderson: Swanson has made a huge career turnaround from those WEC days, but it’s odd how the MMA world viewed him before his sudden surge. It probably had a lot to do with his first WEC loss, which came via submission to Jens Pulver. Pulver is a legend, but he’s not known for his submissions and Swanson was the only win for the former UFC champ during a nine-fight stint from 2006 to 2010. That loss made Swanson look bad. Consider his other defeats in that era, though. He was knocked out in eight seconds by future WEC and UFC champion Jose Aldo—embarrassing, sure, but Aldo was vaporizing people back then—and his other losses came to eventual UFC title challengers Chad Mendes and Ricardo Lamas. To put it in simple terms, the Pulver loss now looks like an anomaly and Swanson really only struggled against the division’s elite class. As for the borderline contenders Swanson has defeated, the list includes striking victories over tough fighters like Ross Pearson, Charles Oliveira and Dennis Siver and hard-fought decisions against Dustin Poirier and Jeremy Stephens. He’s demonstrated the ability to edge strikers and grapplers, but none of those guys were established top contenders or former champions. 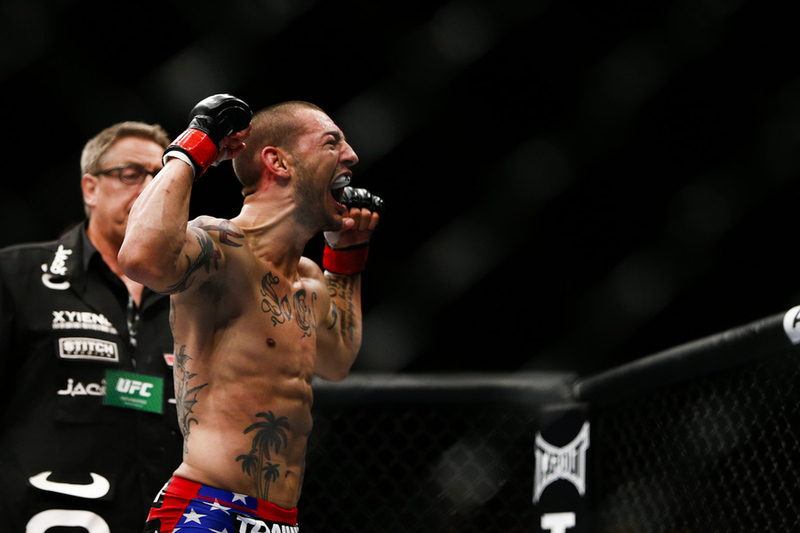 In Edgar, Swanson is back to the level of competition he faced in Aldo, Mendes and Lamas. Edgar held the UFC lightweight strap and challenged unsuccessfully for Aldo’s featherweight belt. He has a history of success against everyone not named Aldo or Benson Henderson. Edgar hasn’t been a force at 145 pounds, though, which is where I find optimism for Swanson’s chances. The assets that served Edgar well as a 155-pounder, namely his speed and footwork, haven’t been as notable at featherweight. He was on the wrong end of a decision against Aldo and dominated a B.J. Penn who fought nothing like the dangerous champion Edgar upset four years earlier. Edgar’s victory over the aforementioned Oliveira is his only impressive performance against a featherweight who posed any threat to him. Yet, even if Edgar’s footwork and speed are in place and he’s at his absolute best as a featherweight, he’s up against a striker who can dole devastating punishment in lightning-fast bursts. Swanson is fast, but it’s his power that really could be the key in this fight. Edgar has been rocked on plenty of occasions. He’s usually able to recover and come back, but he hasn’t had someone like Swanson delivering follow-up punches. Swanson has never managed to clear the hurdle against a top-tier fighter like Edgar, but he seems to be in the same zone now that we’ve seen welterweights Robbie Lawler and Matt Brown enter recently. Edgar’s shaky chin gives Swanson a route to victory, and it’s one Swanson will gladly take. Whether he gets the knockout is debatable, but he’ll do enough damage to edge Edgar on the scorecards at the very least. Just because he lost a couple decisions, at least one of which was highly questionable, does not mean that Edgar has shown any weaknesses that Swanson can exploit. He can box, wrestle and grapple as good or better than any of the guys Swanson has recently faced, and he was able to deal with the reach advantage of Henderson quite impressively, making that a non-issue with Swanson. In fact, even with a one-inch height advantage, the Jackson’s MMA fighter Swanson still has shorter arms than the Phil Nurse-trained striker. I would tend to disagree with Bryan in regard to Edgar not being a force at featherweight. His only loss was to the division champ, and while Penn looked terrible in their last fight, Edgar looked energetic, tuned up and able walk right through his opponent. Swanson looks great, and he is rightfully confident that he can win this fight. However, considering some of the guys who have been unable to knock out Edgar, I really don’t see Swanson being the one to pull it off. If this one turns into a typical Edgar marathon, the younger fighter could claim the win on the scorecards, but I’ll go against the grain and pick the former lightweight champ to take this one by unanimous decision. With his wins over Josh Thomson and Pat Healy, Bobby Green inched closer to the top tier of lightweight contenders while extending his winning streak to eight fights. Now, he’s been paired with striker Edson Barboza. How far can Bobby Green take his perfect UFC record? Will he make it all the way to a title shot? Kuhl: Green is one of those rare anomalies that is creeping up the lightweight division completely under the radar—well, outside of his Twitter rants this fall. He has grown up in a very tough environment, has family members getting shot in gang violence, and has even been rumored to have hits out on him. It is absolutely amazing that this guy even has time to focus on his career. The win over Thomson was easily the biggest of his career. He is a classic American fighter who is good everywhere and has a wrestling base to back it up. Even as well-rounded as Green is, a couple years ago it would have been ludicrous to think that he could beat Barboza. Then, the dazzling Brazilian striker was knocked out by Jamie Varner, and then submitted by Donald Cerrone. To his defense, Barboza does have four knockouts in his eight UFC wins, but his ability to stop nearly anyone has definitely slowed since entering the Octagon. The only reason I bring up Barboza’s couple losses is that, as talented as he is, he sometimes gets ahead of himself and doesn’t fight at the top of his ability. There is almost a cockiness in the way he carries himself. Against a focused guy like Green, that could be detrimental and leave him exposed for an unexpected defeat. If the best Barboza comes out, that may not be the case, but Green has a real chance to extend his streak on Saturday night. As for the longevity of that streak, I just don’t see it, only because of the guys he will have to go through to maintain his unblemished UFC record. If he defeats Barboza, his next opponent is most likely going to be a top-five guy, and the likelihood of continuing this run will proceed to diminish. For now, though, I have Green extending his streak and taking Barboza the distance for a grinding decision victory. Henderson: Green has been somewhat of a revelation in the UFC. 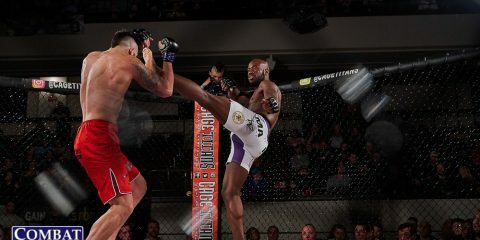 He entered Strikeforce in 2011 after a run as the King of the Cage lightweight champion, but he had already suffered a loss to Tim Means under the KOTC banner. His big introduction on the national stage came at Strikeforce’s Fedor Emelianenko vs. Dan Henderson event, where Green suffered a split decision loss to Gesias “JZ” Cavalcante. He toiled away on Strikeforce Challengers shows and in mid-card fights on Strikeforce’s more significant events. He won every one of those fights after losing to JZ, but he was hardly positioned as a lightweight contender on the much smaller Strikeforce roster. Therefore, his emergence in the UFC isn’t exactly something I can say I saw coming. When he debuted against Jacob Volkmann, it seemed like a fight that could go either way. Well, Green submitted the outspoken grinder. A first-round TKO of James Krause followed, and then the big wins over Healy and Thomson. Indeed, Green has quietly snuck up on everyone in going from a mid-carder in Strikeforce to a fighter who is arguably maybe two or three fights, at most, away from a title shot. Barboza offers Green with another interesting test along that journey. Where Healy is a grinder and Thomson has also picked up a habit of going the distance at the highest levels, Barboza is a finisher. However, as Dan pointed out, there’s a big question mark surrounding the Brazilian’s consistency. He can put up flashy performances, but he also makes mistakes and struggles against tough opponents. Green is confident in his stand-up, but his wrestling background makes him a threat to put Barboza on the mat. That mix of skills, combined with Barboza’s inconsistency, leads me to believe that Green will extend his streak in this fight. And, yes, his next fight will have to come against a top guy. He already contributed to knocking Healy down a peg and holds a win over Thomson (astoundingly, though, Thomson still sits one spot above Green in the UFC rankings). If he adds Barboza to the list of victims, he’s staring at a match-up against someone like the aforementioned Cerrone. And that’s where Green’s success will come to an end. Matt Wiman has been floating through the UFC for over eight years, and he has never really gotten close to any sort of title hunt. What will it take for Wiman to break through the proverbial ceiling and get an opportunity to be on any sort of title run? Henderson: Consistency? The right mentality? A regular schedule of fights? Those three things come to mind immediately when I look at Wiman’s lengthy run in the UFC. This is a guy who is a respectable 9-5 inside the Octagon and 15-7 overall, but he has plenty working against him. Wiman has suffered injuries that have kept him sidelined for extensive periods, and he’s now set to return after a nearly two-year layoff. The reason for that layoff isn’t exactly clear, but it’s no secret Wiman tends to suffer from anxiety leading into his fights. Perhaps he was contemplating retirement this time around? He’s had fights where he lacked sponsors and seemed to come in with a very minimal corner crew. Those are all things you don’t often see from someone who is on their way to the top. Wiman has to set his mind right and maintain a busier fight schedule if he wants to make a run at a championship. Staying healthy would be a big boost to his chances as well. It’s not like Wiman lacks talent. There are people out there who would argue that he won his fights against Dennis Siver and Sam Stout. And while his first win over Mac Danzig was mired in controversy, he defeated Danzig in their rematch to settle any debate there. Take away the Siver and Stout losses and the defeats he suffered much earlier in his career, and what you have is a fighter who dropped a decision to Jim Miller during Miller’s 9-1 run towards UFC contendership and got knocked out by T.J. Grant as Grant was experiencing a sudden surge of success. Wiman has only been knocked out twice and he’s never lost by way of submission. He keeps fights close, even against some of the better fighters he’s encountered. Against Isaac Vallie-Flagg on Saturday, he’s looking at another fight that’s going to come down to the wire. I think Wiman can claim the nod, but it’s what comes after the victory that’s most important. 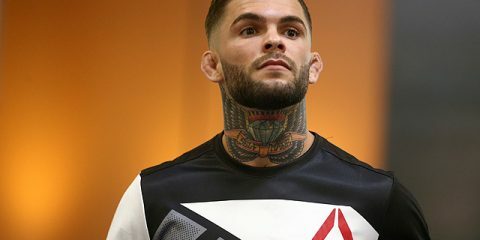 He needs to emerge healthy and focused, and he needs to turn around and get back in the Octagon within the next three to four months, win again, rinse and repeat. If he can do that, he could indeed rise to contender status. Kuhl: Bryan pretty much hit the nail on the head. Wiman is one of those rare guys who is extremely well rounded, has fared well in the promotion, and could easily have an even better record if it wasn’t for the slanted opinions of a couple individuals. Wiman can submit people, he has knockout power, and he has an average build for a lightweight. The biggest thing he’s missing is consistency—not necessarily in performance but in his overall career. Vallie-Flagg is not exactly a top-10 guy or anything, but a win over him, especially after a 22-month layoff, would be a step in the right direction. If ring rust proves to be a non-issue, I look to Wiman to take a decisive victory in this one. And if the UFC brass gives him a top-15 opponent in his next fight, he could easily be one or two fights away from a significant bout. Dustin Ortiz has an astounding five split decisions in his last eight fights. Each of his last three UFC fights ended in split verdicts. Ortiz has often been the spoiler in these fights, losing only two of those contests. Now, he’s fighting Joseph Benavidez, a perennial top flyweight contender who has come up short on two occasions in title fights with champ Demetrious Johnson. Can Ortiz keep his improbable streak going? Furthermore, if he edges out another close decision win, is he really worthy of title consideration? Kuhl: Looking at the reality of it, when Ortiz faces title contenders—for example, Ian McCall and John Moraga—he can’t seem to tilt the fight in his direction, even when it heads to the scorecards. When it comes to flyweight title contenders, Benavidez is not just another one. He’s the one. The only flyweight who has beaten the Team Alpha Male mainstay is the champ. Outside of Johnson, no flyweight has come even close to a split decision loss to Benavidez, and he has finished three of his last five opponents, which is a rare trait for a 125-pounder. Ortiz comes from a top camp at Roufusport and has definitely put on some great performances, but he has just the one dazzling finish over Jose Maria Tome and couple split decisions over Ray Borg and Justin Scoggins. None of those really nod toward title contention. I really don’t see Ortiz beating Benavidez, and I actually look to the former title contender to continue taking out flyweights until he gets his third shot at Johnson. Benavidez stops this one by submission in the second. Henderson: If Ortiz does make it into title contention with anything less than a convincing win against Benavidez, it’ll be the most sneaky move into a title bid this side of Chael Sonnen talking his way into a championship bout at light heavyweight. Granted, Ortiz has been a tough opponent for everyone he has faced inside the Octagon, but he hasn’t looked very impressive outside of his UFC debut. The Roufusport fighter scored a third-round finish of Tome, but then posted the split decision loss to Moraga. His next outing was a win over Borg, but it felt more like a robbery than a hard-earned victory. Ortiz deservedly edged Scoggins on the scorecards, but that too was a close fight in which Ortiz didn’t exactly overwhelm his opponent. The topic of Ortiz and title bids should be put to rest in this fight. I, too, see Benavidez as the type of force that Ortiz cannot overcome. To take Dan’s point a step further, the Team Alpha Male fighter has not only demonstrated his elite abilities at flyweight, but also at bantamweight. As a 135-pounder, his only losses came to Dominick Cruz, first in a bout that earned Cruz a title shot and then in a bid for the title Cruz won. Benavidez has made it obvious throughout his career that only the best stand a chance of defeating him, and Ortiz is far from the best. Ortiz has never been finished, so Benavidez may have to settle for the decision. However, there’s no way this one is going to be as close as Ortiz’s last three fights. Henderson: As much as I’d like to point to the women’s strawweight battle between Kailin Curran and Paige VanZant as this card’s sleeper, I don’t quite think it has the proper ingredients—the pair has combined for six decisions and just one stoppage in seven total professional outings. Therefore, I’ll turn elsewhere and single out the evening’s opening contest between Doo Ho Choi and Juan Puig. I know, it’s an odd choice, but there’s a lot of potential there for a great kickoff to the event. Puig’s Octagon debut didn’t go well. The Mexican fighter was knocked out by Adriano Martins before the midway point of the first round. In his career, however, Puig has made a habit of securing first-round submission finishes. The 25-year-old doesn’t go the distance often, and even his losses happen in a hurry. That latter detail is what makes this a potentially fun fight. Puig’s opponent is a 23-year-old South Korean fighter who has eight finishes by some form of knockout. The potential is definitely there for Choi to follow in the footsteps of Martins and put a stake through the heart of Puig’s UFC career. Choi has been inactive for nearly a year and a half, though, and this will be his first fight outside of Asia (and we know how that usually goes), so the potential is also there for him to end up on the losing end of this encounter. With so many factors suggesting a quick finish, there’s always the likelihood that this fight turns out to be a total stinker. However, I don’t think that’ll be the case this time. Choi might need a round to warm up, but he’ll eventually start testing Puig’s chin. And that chin is bound to fail, leading to a highlight-reel finish in this fight. Kuhl: I’m not sure if this is necessarily a sleeper or not, but the casual fan will not want to miss the match-up between Ruslan Magomedov and Josh Copeland, neither of whom are exactly household names. Magomedov is a tall Russian striker who trains at Jackson’s MMA in Albuquerque, N.M., and has also spent time at the Fairtex camp in Thailand. He’s a 6-foot-5 kickboxer who has, interestingly enough, had some trouble finishing people in the last few years. His UFC debut in May was against a grappling purist, Viktor Pesta, who was much shorter. Yet, Magomedov couldn’t even put him away. Copeland is a 9-0 striker who has only been to decision twice. 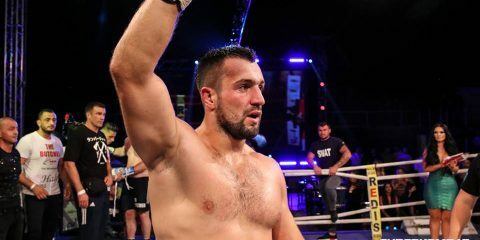 He possesses major knockout power, which he unleashed on Jan Jorgensen to earn the RFA heavyweight title and a spot in the UFC. The guy is calculating, powerful and extremely accurate. To me, this is the ultimate sleeper fight. Magomedov is riding a lot of recent decisions, which doesn’t look great on paper, and Copeland is an absolute beast, but one very few have heard of. I’m looking to Copeland to take a TKO win as he lets the world know exactly what he’s all about. Kuhl: The fact that it has sleeper, highlight-reel night written all over it. This is one of those free cards with a lot of lesser-known fighters that the casual fan will probably skip over in anticipation of the main event. However, any die-hard fan knows that with people like Wiman, Copeland, Vick, Rosholt, VanZant and Oliynyk on the docket, this is a true diamond in the rough on a weekend with not much else to watch besides Metamoris, if grappling-only events are even your thing. Henderson: A stacked plate of nachos with all the fixin’s. Texans love their Tex-Mex, a style of food that combines flavors from Mexican and American cuisine. Much like a plate of nachos smothered in beef, shredded cheese, jalapenos and other garnishes, UFC Fight Night 57 features a little of everything and a rich helping of flavor. There are prospects in the earliest stages of their career, including VanZant and her opponent, Kailin Curran. There are fighters seeking to take the next big step, such as Copeland. 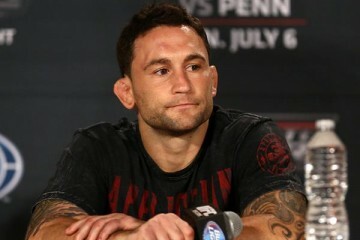 And, of course, there are the contenders, Frankie Edgar and Cub Swanson. And that’s just skimming the surface. Whether you’re looking for established names or the UFC’s future stars, this event has something for you.